The exclusive gated residential complex offers plenty of space, fresh air and proximity to nature. 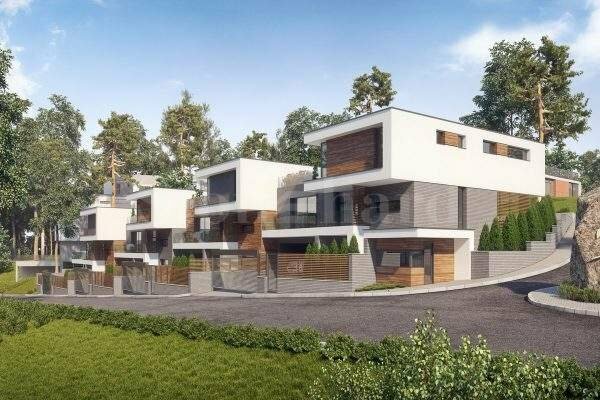 It is situated on the most peaceful and sunny part of Boyana District and features luxury houses over an area of 10 acres. It is positioned on a natural hill, near Boyana Residence and reveals splendid panoramic views towards the city and the mountain. Due to the proximity to Pushkin Boulevard, the owners will enjoy easy and fast access to all parts of the city. The center is 9 km away, while Sofia Airport is 19 km away. The family houses offer a high standard and excellent living conditions, but they also represent a lucrative investment opportunity as they will increase their value over the years. Each of the houses has a yard with an area between 1407 sq.m and 2180 sq.m, and there is also a well-arranged inner neighborhood alley. Each of the yards has preserved valuable tree species that form a pleasant park environment. 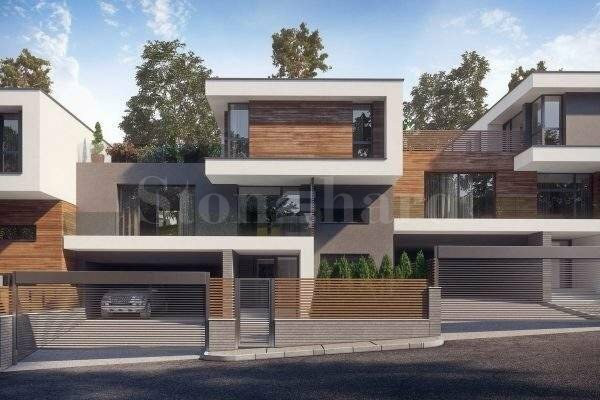 At present, the complex features four houses, currently for sale is 6B house which is built on two floors, with a total built-up area of 290 sq.m and a yard of 324,49 sq.m. All properties in the complex impress with their modern appearance and lines that follow the terrain. On the first level of the house there are an entrance hall, a technical room, a basement and a garage for two cars. On the second level there is a spacious living room with dining area and a fireplace, a separate kitchen, a bathroom and a small storage room. Thanks to the panoramic windows and sliding doors, the yard feels like a natural extension of the living room. On the second floor there are three bedrooms, a bathroom/wc, a wardrobe and a laundry room. A spacious antechamber leads to a panoramic terrace. In the garden zone adjoining the houses there is a relaxation zone, a barbecue, nicely landscaped areas, and two parking lots for guests. Monolithic reinforced concrete structure, with beamless structural frame. The walls are made of ceramic blocks Winerberger Porotherm, Baumit insulation 12 cm. The facades combine a heat-insulating system and are lined with stone, HPL with wooden floder and two silicone plasters in architectural detail. The heating is done through a gas condensing pot, included in the price is a 200 litre boiler, condensing boiler (VIESSMAN) and Italian radiators. Connection to the sewerage network. A plumbing network with polypropylene pipes with aluminum sets, heat-and soundprooven, meeting all modern standards. Low-voltage installations for cable TV, telephone / intercom, Internet, respectively RK-75, UTP 4 x 2 x 0.5 sq. M.
The house is available plastered. The construction works on the house are expected to be completed in March 2018. On several installments upon negotiation with the investor.